Also, the upper part of the body will tilt “stronger” when he’s leaning to one side to move the other leg, which is again adding to the instability. The gimbal mechanism to counter balance that is re-active, not pre-emptive. And of course, the weight on the upper part is also reducing the “re-activity”. 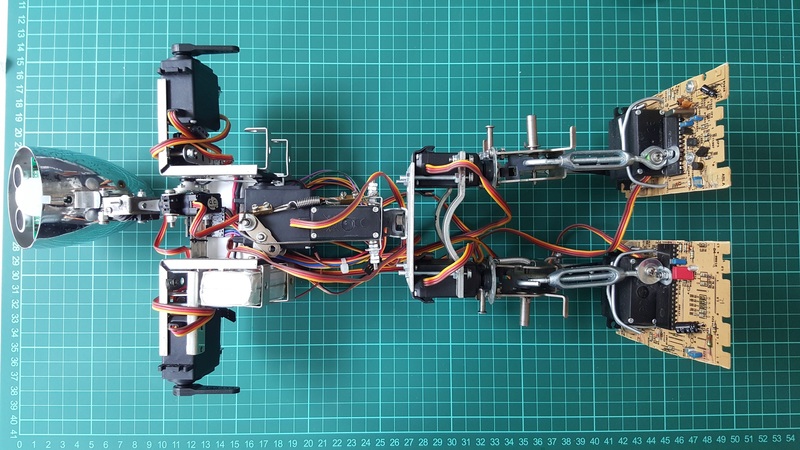 The next part in this series will cover experiments with different movements to check out the new geometry and to understand whether we can improve the gait without adding new servos to the feet for the counter movement of the hips. TrashBot v1.0: my first four-servo biped robot that actually walks.